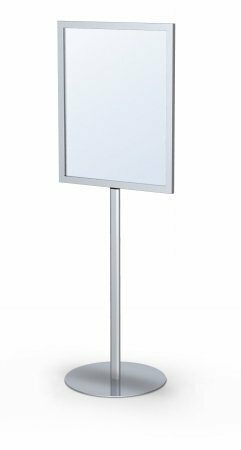 NST2228S Color: Satin Silver, Size: 22" x 28" Features: -Signholders. -Solid double bolt connection. -Wide format alloy frame. -Racetrack oval upright. -0.25" full top loading for graphic insertion. -Made in USA. Loading: -Front. Mounting: -Free Standing. Orientation: -Portrait. Sign Holder Type: -Pedestal Base. Country of Manufacture: -United States. Product Type: -Sign Holders. Dimensions: Overall Depth - Front to Back: -19". Size 22" x 28" - Overall Height - Top to Bottom: -65". Size 22" x 28" - Overall Width - Side to Side: -22". Size 22" x 28" - Overall Width - Side to Side: -28". Size 22" x 28" - Overall Product Weight: -20 lbs. Size 24" x 36" - Overall Height - Top to Bottom: -73". Size 24" x 36" - Overall Width - Side to Side: -24". Size 24" x 36" - Overall Width - Side to Side: -36".